EMBLetc. 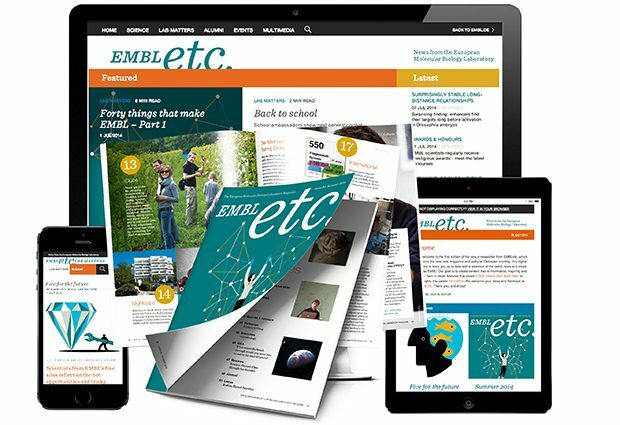 is the news website of the European Molecular Biology Laboratory (EMBL), where you can read the latest about our research, get a glimpse of life in the lab, follow the pursuits of our staff after they move on and become alumni, keep up with innovative endeavours in training and get the inside scoop on conferences and other events. EMBL is Europe’s flagship laboratory for the life sciences, with more than 80 independent groups covering the spectrum of molecular biology. EMBL is international, innovative and interdisciplinary – its 1600 employees, from many nations, operate across six sites: the main laboratory in Heidelberg, and sites in Barcelona; Grenoble; Hamburg; Hinxton, near Cambridge (the European Bioinformatics Institute), and Monterotondo, near Rome. Founded in 1974, EMBL is an inter-governmental organisation funded by public research monies from its member states. The cornerstones of EMBL’s mission are: to perform basic research in molecular biology; to train scientists, students and visitors at all levels; to offer vital services to scientists in the member states; to develop new instruments and methods in the life sciences and actively engage in technology transfer activities, and to integrate European life science research. Around 200 students are enrolled in EMBL’s International PhD programme. Additionally, the Laboratory offers a platform for dialogue with the general public through various science communication activities such as lecture series, visitor programmes and the dissemination of scientific achievements.